Where does your USB flash media come from and can you trust it? The USB flash market is a very tricky market as it’s not as closely regulated as other forms of media. In fact, outside of the form factor of the USB connection, there are a lot of leeway for manufacturers that create a huge gap between good and bad quality USB drives. This gap is made even wider by the fact that flash is transitioning to 3D NAND Flash and the demand is greater than the supply. 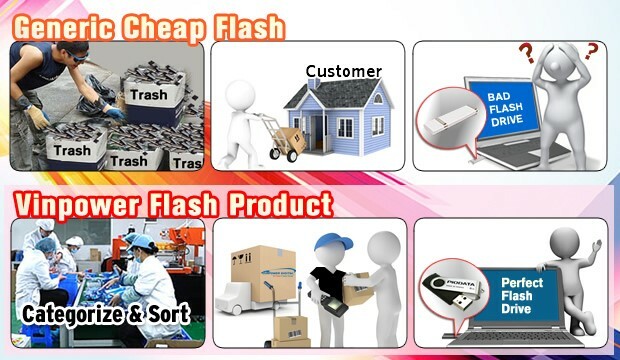 Because of the shortages and rapid fluctuations in costs, many suppliers are resorting to providing recycled elements or merely passing off defective flash in order to fill orders and offer cheaper pricing. In the end, there’s no way to tell if a USB flash drive is made from recycled parts or is defective just by looking at it. Even when you plug the drive into a computer, the limited details available may not reflect the problems that can/will occur when you attempt to use it. So, many customers are duped by the low pricing. They take a chance and end up realizing they have a high defect rate when trying to copy these drives. Worse yet, they’ll find that partial or the entire content disappears without warning and you are left with a useless drive that lost what could have been very important content. So how can you tell which USB flash is safe and which is potentially defective? The only way to do that is by working with the various flash controller developers and using very specialized software tools developed to inspect and diagnose every single flash drive inserted into it. This is what Vinpower provides when you purchase your USB flash drives from us. Not only do we work with a large array of USB flash controller and memory manufacturers and suppliers to get the special software tools needed to inspect them, but we also build the hardware that allows us to implement that software on tens, hundreds, even thousands of drives at a time. Vinpower can do in-depth testing that no other supplier even thinks about offering so that we can provide 100% guaranteed perfect USB Flash drives with every single order. For more details about Vinpower’s USB flash offerings, please visit our website, www.vinpowerdigital.com, or contact a Vinpower representative near you. With so many companies leaving the industry, Vinpower is a beacon of stability and reliability! I receive weekly emails from our A/R insurance broker highlighting companies that are close to or in the process of declaring bankruptcy. Even in the duplication market, the landscape has changed dramatically with many companies, both large and small, leaving the market, in some cases voluntarily and others through bankruptcy/insolvency. However, through it all, Vinpower remains healthy and very active in developing products that support and advance the goals of the duplication market. Vinpower may not be on the fast track to Microsoft or Apple type revenue, but we have managed to steer clear of pitfalls and provide our customers with solid reliable hardware, media, and support, all while offering very competitive pricing. I’m not bringing this up to brag about Vinpower’s good fortune. 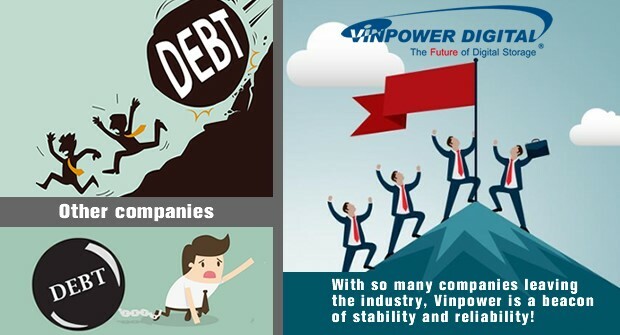 Rather, to let everyone know that when you’re looking at the market landscape and wondering who will still be there when you need them, you can rest assured that Vinpower will still be standing strong and proud to support you. Why wait until you’re desperate for a solution, talk to Vinpower today to see how we can support your efforts in the digital duplication marketplace. For more details about Vinpower’s products, please visit our website, www.vinpowerdigital.com, or speak with a Vinpower representative in your area. WARNING! 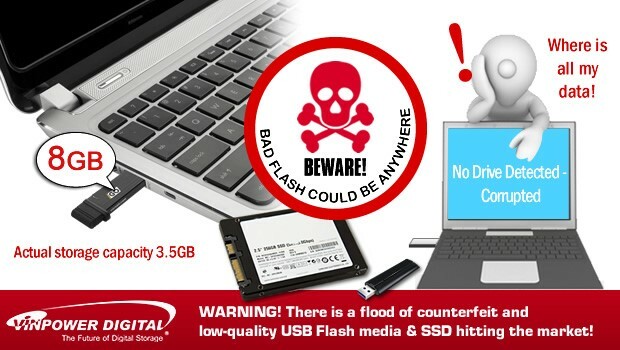 There is a flood of counterfeit and low-quality USB Flash media & SSD hitting the market! USB flash media and SSD hard drives are gaining in popularity and usage amongst all those looking for faster and more reliable methods to save and share digital content. The problem is that as demand increases, the stability and reliability of the supply decreases. This imbalance is creating opportunity for those to take advantage of the situation by passing off defective, mislabeled, and low-grade USB and SSD to a marketplace looking for cheaper solutions. The notion that you get what you pay for has its merits, but sometimes it doesn’t matter what you pay if you can’t rely on the source or have any proof what they are claiming is actually what you’re getting. That’s why Vinpower has entered into the USB flash and SSD hard drive business. To remove the risk of not getting what you ordered or discovering later that the drives are actually defective and deceptive. As a USB flash and SSD duplicator manufacturer, Vinpower has developed tools to help weed out the bad USB flash and SSD drives from the good ones to ensure 100% reliability and sustainability. There have been many cases where the drives did not actually contain the memory size indicated on the drive or that there are numerous bad sectors that could cause you to lose parts or all of the data stored on the device. It’s just not worth the risk to save a few cents on a USB drive or a couple of dollars on a SSD. Vinpower can provide that sense of security and confidence that the product you buy would have been fully tested through our intensive H2+ testing facility and that all products will 100% match your specifications without failures or devastating loses. For more details about Vinpower and our expansive product line, please visit our website at www.vinpowerdigital.com, or contact a Vinpower representative at a location near you. For more details on Copy Protection or any of the Vinpower Digital product line, please visit our website, www.vinpowerdigital.com, or contact a Vinpower representative near you.